CHICAGO, Jan. 30, 2019 /PRNewswire/ -- Sysmex America, Inc., a leading diagnostic solutions company offering hematology, urinalysis and flow cytometry testing technology that improves clinical laboratory performance, announced the availability of its first fully automated urine particle counter and digital imaging system, the UN-2000. By combining urine flow cytometry with digital imaging, Sysmex's UN-2000 provides laboratories a highly standardized and more efficient process for urine sediment analysis, one with less manual intervention time and greater accuracy. "Today's laboratories are pressured to produce accurate, valid, and high-quality results that provide clinical value to the physician, all while meeting turnaround time expectations with less staff and tightened budgets," said Andy Hay, chief operating officer of Sysmex America. 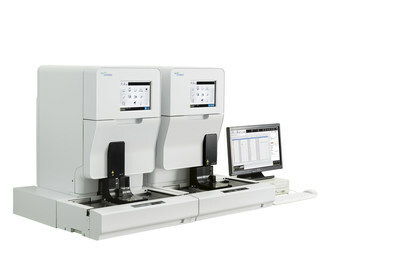 "The UN-2000 meets the needs of today's labs with scalable automation and new levels of standardization, quality assurance and workflow efficiency," Hay said. Sysmex America is lighting the way to better health with diagnostic solutions that transform the future of healthcare and contribute to healthier lives. Its innovative hematology, urinalysis and flow cytometry testing technology is reshaping the world of diagnostics. As Americas regional affiliate of Kobe, Japan-based Sysmex Corporation – a trusted global leader respected for optimizing the efficiency, operations and financial performance of clinical laboratories – it offers diagnostic products that equip patients and the healthcare professionals who treat them with the information needed to make decisions with greater trust and confidence. Forbes magazine named Sysmex one of the most innovative companies in the healthcare equipment and services category, and the Center for Companies That Care named Sysmex America to its "Honor Roll." Learn more about Sysmex America at www.sysmex.com/us.